The spectacular, emotional conclusion to my all-time favorite love story! Exhaustingly intense. Piercingly agonizing. Achingly beautiful. Enduringly romantic. Through years of war and devastation, Tatiana and Alexander suffered the worst the twentieth century had to offer. Miraculously reunited in America, they now have a beautiful son, Anthony, the gift of a love strong enough to survive the most terrible upheavals. Though they are still young, the ordeals they endured have changed them–and after living apart in a world laid waste, they must now find a way to live together in postwar America. How does one get past this series? How can you even begin to compare other love stories to the one of Tatiana and Alexander? You just cannot, I think. The three books will forever sit on a shelf all their own, for what they imparted is an unforgettable story of love and survival… come what may. 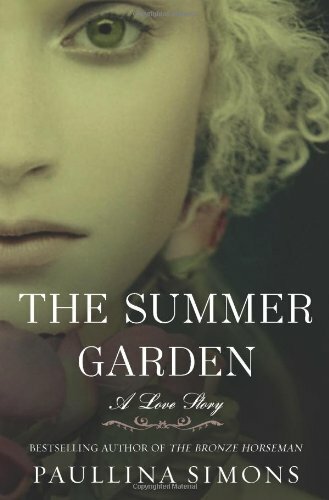 Book 3, The Summer Garden, is quite different from book 2, which is different from book 1. Each book tells a unique part of their story, of their struggles, of their love. The Bronze Horseman is about Tatiana and Alexander coming together, believing their love is real, unstoppable, forever… alive and burning despite war and starvation. Book 2, Tatiana and Alexander, is about fiercely fighting fate and finding each other in a sea of impossible circumstances… it’s about being relentless and unforgiving in your pursuit of happiness. The Summer Garden is a tough read. It’s about survival, but this time it’s not only about surviving war, it’s about surviving time, change, insecurities, pride, betrayal… and all without giving up when it all just seems like too much to bear. Sometimes, I think it’s almost easier to survive something tangible like war or hunger, than something as deeply cutting and intangible as a broken heart. A disappointed heart. An angry heart. Matters of the heart consume voraciously, tilting the world on its axis until you don’t know what’s wrong and what’s right… where the blurry line solidifies to become one moment too many to keep enduring before calling it quits. Or is there really an uncrossable line when it comes to your soul mate? “Where was he, her Alexander, of once? Was he truly gone? The Alexander of the Summer Garden, of their first Lazarevo days, of the hat in his hands, white toothed, peaceful, laughing, languid, stunning Alexander, had he been left far behind? Well, Tatiana supposed that was only right. For Alexander believed his Tatiana of once was gone, too. The swimming child Tatiana of the Luga, of the Neva, of the River Kama. Coming back from the pulse-pumping experience of Alexander’s almost life-claiming liberation, I felt an overwhelming sense of relief. But that feel-good feeling quickly vanishes as we realize that Alexander struggles to adjust to civilian life, retreating into himself and becoming a hard, cold, callous person. For me, being so invested in their relationship, this part of the book was really painful and heartbreaking to read and it felt very REAL. Their closeness and intensity became a frigid façade… a widening chasm that continued to expand. This was a chasm widened by pride, insecurities, fear and even love, because if they didn’t love each other so ardently, they wouldn’t have shattered hearts. Their relationship thrived in the violent throes of war and the pressing intensity of their struggles, so suddenly, when they begin a new life in the quiet of everyday trifles, everything comes apart. Then, on top of that, their safety comes into question again, and the stress I thought I left behind in book 2 emerged again, and I was fearful that they were never going to have peace. And then LIFE… FATE… continue to push and push and it all begins to unravel even after some possibly unforgivable choices. I felt so betrayed, crushed and saddened. I just FELT and FELT and FELT EVERYTHING. I found it quite interesting that at this point, I am SO deeply connected with these characters, so understanding of what they’ve been through, that I no longer saw their faults… I saw their humanity. I love Tatiana and Alexander… for every flaw, for their fighting spirit, for their fiercely stubborn love and even for their unwavering pride. The Summer Garden spans years, and you really see their life unfold moment by moment, year by year. Their memories were my memories… I LIVED IT. I FELT IT. I was so emotional during this book, so vulnerable, so impacted by everything that happened. I was a big, fat, ugly mess of tears the last 30% or so of the book and by the end I was sobbing. It’s incredibly difficult to summarize my thoughts on this book and the series, but there’s a few important things I want to impart. First off, the writing is stellar. Stunning. Amazing. Perfection. Poetic. Throw every praising adjective you can at it… it’s brilliant. Secondly, because of the writing, because of the story, I just FELT the entire series. I was deeply, emotionally moved… so much so, that I know for a fact that I will never forget this story. It’s an instant classic, belonging in the ranks of all the greats. Thirdly, Tatiana has become my favorite female character… her strength and selflessness is inspiring. I was in awe at her uncrushable spirit and her limitless capacity for love. Lastly, this is the most amazing love story ever told. What else can I say? I’m so sad to have come to the end of this experience… exhaustingly intense, piercingly agonizing, achingly beautiful and enduringly romantic. My all-time favorite series. Numero 1. A million bright, shining stars! Perfect review for a perfect book and series. Just reading that one quote again makes me want to reread this series again. It’s the one story I don’t know how to shake, not even after time and multiple readings. Just reading that one quote… It take me RIGHT BACK, and I never want to leave. You really captured the best expression of how I feel for this series in these reviews. And I thank you for it. I have never been able to adequately express how I feel about these books into a tangible review because they do make me feel everything. But you did. Wonderfully. That means a lot! I honestly didn’t know what to say or how to convey it. It’s so hard when this book, this series, just means so much! You did an amazing job. So amazing, I’m thinking of adding a link to these reviews to my GR reviews. Because to be honest, they weren’t reviews at all. Just a few incoherent babble comments because I couldn’t express even a fraction of what these books make me feel. You hit it. Cindy, you seriously made my day!